Before I get started I would refer everyone to Frank’s tremendous No Code thread. DirtyFrank0705 was a great friend of our forum who was lost to suicide in 2008 before he could finish his Tour. What he did finish is well worth the read. As always with these threads, the goal is to foster discussion about the album as a piece of art--the themes that run through the words and music, the mood it creates create, the way the individual component parts add or subtract from that effort. These aren't song of the moment threads. Hopefully we can do better than “I really like In My Tree”. And obviously what follows is just my interpretation. I look forward to reading yours. Before we get started it is worth saying a bit about where No Code fits within the larger Pearl Jam catalog. No Code is the first real serious change of direction within their music, at least in terms of themes. Ten and Vs. are angry, youthful albums. They are animated by a sense of loss and betrayal. They rage against the meaning and security, the sense of place and purpose, that was stolen. But they are also albums that are strongly grounded, and loss is mitigated by a feeling of certainty that is not necessarily present on No Code. The songs on these early records may not know the way forward, but they are extremely confident that they know who is to blame, and are optimistic that if we keep pushing for answers, for a way forward, we’ll find it. There is not wisdom here , but there is conviction that we’ll get there eventually (Leash captures this particularly well, but it runs through most of the early records). These albums knew where they were even when they were lost. I am here. Where is everybody else? We see some doubt setting in, in some pretty dramatic ways, on Vitalogy--there is a sense of being overwhelmed whether or not the confidence and certainty of Ten and Vs. was justified, but it is never abandoned--just replaced with a Sisyphean commitment to seeing the journey through. There is a lot less hope and so the album doubles down on defiance. No Code marks a break from these early records since it is the first time the band starts writing from a place of wisdom, as people who have finished the journey and found the answers. It is hesitant, incomplete, preliminary, but a definite shift in focus. The title is misleading in that respect. Amidst all the confusion, uncertainty, doubt, ambiguity, and insecurity there is in fact, a code. There are insights and answers. We have guideposts. We may even have a guide. Although you have a seemingly random collection of pictures on the cover of the album, when you unfold it and step away--when you approach it from a distance--order starts to reveal itself. After No Code every album will attempt to build upon the idea that the music should offer answers, not just questions and companionship. Yield does so in obvious ways. Binaural, the album that in many ways feels the most lost, is still in some sense wiser than the early records in that it is no longer looking to populate a world with black and white, heroes and villains. It doesn’t know how to come to grips with ambiguity, but it can at least identify it Riot Act, in many respects the most defeatist of all the albums, still aspires to be a guide. S/T recaptures the fighting spirit of the early albums while offering a way forward, and then Backspacer is, in many ways, the first album that confidently addresses how to survive in and make peace with an imperfect world. All of that growth, that perspective, begins with No Code, where every song either offers an answer or clears the space to find it. 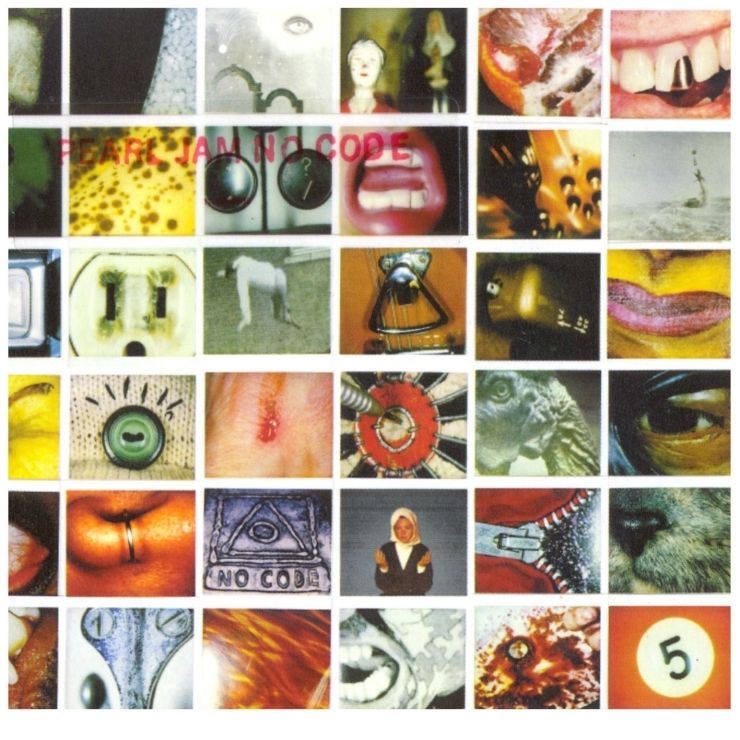 No Code is in many ways the first Pearl Jam record that is not about a journey, but about a destination--every song rooted in some concrete way in a particular place. But I don’t want to overstate this, because these are also the first stabs at something new, and so the answers here are shaded in with a palpable sense of longing and questing. There is a hushed quality to the record, like it is stalking something elusive, that may not even exist, and, if we hope to find it, cannot be disturbed. So Eddie howls less, and the music creates distance (and with it, reflection). It detaches, but it does not retreat. Instead it looks to create safe spaces where, for the first time, we can be given music and songs that come from a different place--the insights of someone who HAS experienced the world rather than someone who IS experiencing it. I don’t want to push this too far, though. Maybe No Code is equal parts question and answer. In the end what I want to argue throughout this thread is that No Code is a record about arriving, the moment where a journey and a destination come together. 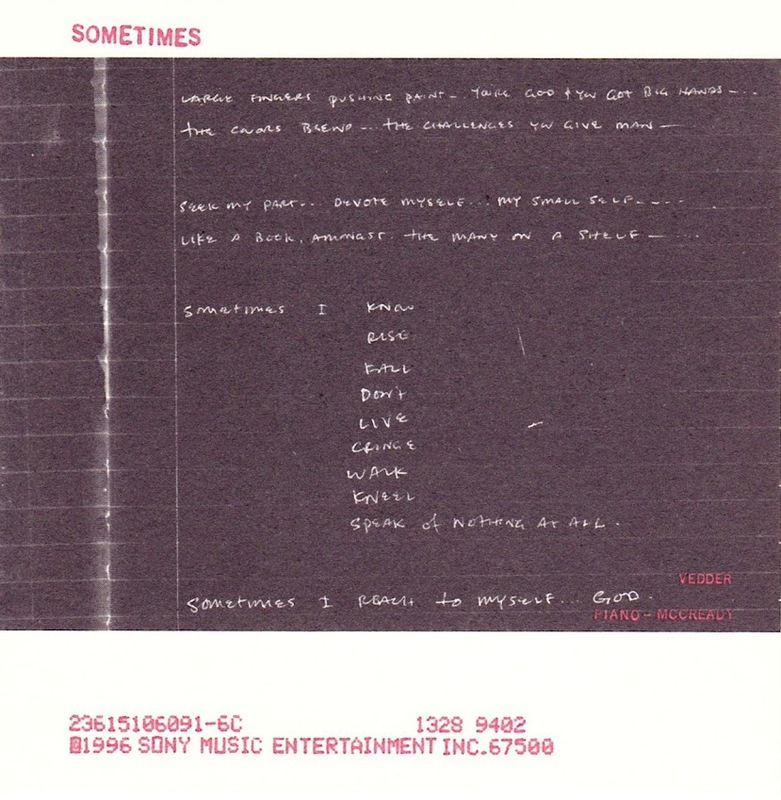 In his No Code tour, Frank described Sometimes as an anti-prayer, culminating, rather than beginning, with the reference to God. I’ve always liked that idea, and think is pretty spot on. It is a prayer, as Sometimes reproduces the vulnerable surrender to something greater than yourself, the acceptance of your own insignificance, the child like hope that something you don’t understand will make it all okay, that is at the heart of a prayer, but it looks inward to the self, rather than outwards to God, to find the answer. Sometime starts with some of the more scenic music Pearl Jam had produced up to this point. It could soft rain or gliding waves but the music feels wet and clean, like it is washing something away. The bass is warm and envelopes the listener. The music isn’t religious, but feels spiritual--sacred, private, even playful in a wry way, like you are finally letting yourself in on a joke you’ve been keeping from yourself. So what’s the joke, then? The joke is the expectation that we can look outside ourselves for answers or for help. The world is a vast and impersonal place. It is very big and we are very small. We need to accept that, and figure out how to move forward from that in whatever small way we can. The big dramatic gestures and outsized expectations of the first records, the millennial feeling that they captured, they lead us nowhere. Eddie’s vocals capture the feel of the song, especially during the anti-prayer’s anti-climax, where the rage is swallowed and disarmed, sliding alongside him instead of propelling him forward. There are moments where it starts to come forward, and you can hear him restraining himself (especially starting from ‘sometimes I cringe...’). That’s not a surprise. Sometimes comes from a calm and peaceful place where you feel safe enough to look inside yourself. There shouldn’t be screaming here.